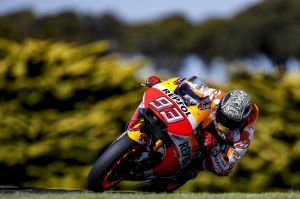 Marc Marquez completed an active second day of testing at Phillip Island, finishing second with a time of 1’29.309” recorded on lap 20 of 107 (more than any other rider). On a day again marked by fine weather conditions (air 20° C, track 40° C), the reigning MotoGP World Champion continued his work on the setup of his RC213V. In the final hour he did two long runs of around 15 laps each, with most laps in the 1’29” range. Dani Pedrosa woke up with a sore throat and a bit of a fever, and after a check-up in the Clinica Mobile, he and his team decided it would be prudent for him to rest for a while in an effort to recover some strength. Dani finally took to the track around 3 p.m. and bravely completed 40 laps despite his less-than-ideal condition. His best lap time of 1’30.245” placed him in 16th position. He hopes to feel better for the third and final day of the test tomorrow.